Not only is this one of the best things to do in Chennai with kids, this museum is certain to amuse even the adults! 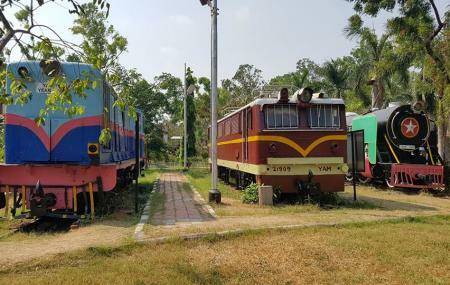 Displaying collections that epic the rail heritage of India, the Railway Museum (ICF) is one place to look out on your trip to Chennai. Having opened in the year 2002, this museum has garnered a lot of attention, especially of train lovers. You will find several miniature gauges, doors and other things related to trains here. All this with a good explanation about each feature, makes this is a must-have attraction on every list of things to do in Chennai. Add in the friendly and welcoming staff members and this is ought to be a delightful experience. How popular is Railway Museum? People normally club together Birla Planetarium and Sri Veda Narayanaswami Temple while planning their visit to Railway Museum. People of all ages can visit this place. It's educational and kids can have a good time in the park . The highlight of this place is the train ride. Tickets for Adults costs Rupee 50 and for Children above the age of 1 and half costs Rupees 25. With this ticket is included The train ride and one Beverage for each Adult that is Free Tea and for kids Biscuits . This place has a museum of train models and trains parts and also photographs. There are some display of sculptures made by some renowned artist. Adults can have a relaxing time taking a walk or resting on the benches of the park. There are three parks for kids to play. The restrooms are neat and there is a small cafeteria for a quick snack. This place is closed on Mondays. Weekends are working and we have to pay entry fees for both kids and adults. They have recently added a train restaurant where you can dine inside a actual train. Definitely everyone will enjoy this place . This place is getting better. Definitely worth a visit. Although the campus is not very large, it is big enough to take a couple of hours to see the whole place. Included in the ticket was one toy train ride and Rs. 10/- of food coupon free. As you enter the gate, on right side is a small cafeteria, which keeps some basic snacks. Not very expensive. Behind that is an air conditioned restaurant in a train coach...the ambiance is good, but food is not great. Prices too are not very high. As you enter the indoor part of the museum, there are quite interesting pictures and exhibits...all these are spread in two floors. On the ground floor there is an art section which requires separate ticket for entry. For lovers of art, it is worth a visit. All art works are around the theme of journey and trains. There is another indoor museum on the far side beyond exhibits of outdoor museum...houses some exhibits on green energy and a working train signalling model. Outdoor museum is good enough for a stroll but still not a match to Delhi Rail Museum. At times there are some philatelic exhibitions going on which are really cool. I m very excited . This place very important and beautiful . All train are ready for running. I one visit you . Very important for me and you. I m very happy. Very good place. All train are made here and all body train are made here .so I request to you please come one time here. I am very happy .why I go here so very important place in our life because I travel in train so know about train which material use so I am happy. One of the best places in Chennai to spend a good evening with family in Chennai. Will be open until 8pm on Saturdays. Rest of days entry closes by 6 pm. Toy train attracts kids and adults alike. Train theme restaurant is good too. Definitely worth your time.